Lots has just been happening on the subject of azhdarchoid pterosaurs - more on that here soon (go here) - and I also have the peccary thing to finish (go here). And sea snakes, the Cupar roe deer carcass, and island-dwelling crocodilians, and other stuff. But now for something completely different. Few people believe me when I say I have what might be one of the biggest collections of toy and model animals. So, for fun, I decided to photograph them all in order to confirm the assertion. Today Will and I completed this little project (several days in the making). Lots of photos resulted: I can't post them all here but if you really want to you can go view them (in higher resolution than viewable here) at my flickr site: click here. In what might be part I of a few (I'm not sure yet), here are some of those photos, with comments. We begin with an assortment of crocodilians. There are a couple of gems here: the large stripey long-jawed animal is a toy False gharial, and on the rock at the right you might be able to see a toy metriorhynchid (and if you want to know what metriorhynchids are go here). 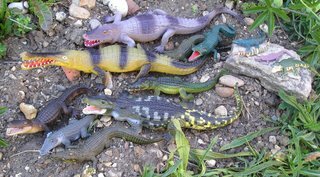 The big chunky animal at middle-bottom is the Safari Deinosuchus, which could be one of the coolest toy animals of all time. Unfortunately it's just dull, but by that I don't mean to diss Deinosuchus of course. Some dinosaurs and other prehistoric animals, including the Safari Smilodon at bottom left. The infamous 'jazz piano player' Dilophosaurus is also at bottom left. The sauropod with the neck grey at the back is a customised version of the Invicta Mamenchisaurus. An assemblage of ceratopsians. 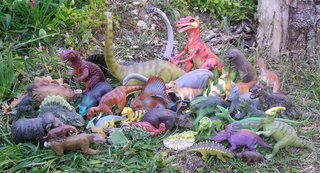 Most of them are pretty poor, but I do like the giant Psittacosaurus at far left. Note also Battat's excellent Triceratops at middle, and the AAA Einiosaurus to its right. And here are some stegosaurs (and a Scelidosaurus in the midde). The Kentrosaurus at far left isn't too bad. Behind it is the green Jurassic Park Stegosaurus. The Battat Stegosaurus ungulatus - equipped with eight horizontally-aligned tail spikes (a configuration now known to be incorrect) - is the best piece. It's brown and orange with red plates and in the foreground on the left. Note that the boxed stegosaur at far right is a blatant rip-off of this model. Various toys on a windowsill. There are a few goodies here: Earl and Baby Sinclair (from the Jim Hensen TV series) at far right, the AAA elephant seal at extreme right, the Safari salamanders at left, and even Rhodan and Godzilla. A few of my favourites, representing animals that you don't see in toy form very often. Red panda and three-toed sloth at left, Tanystropheus and Moschops at right, also Procynosuchus and Sphenodon. Assorted viverrids and mustelids at front left, duck-billed platypus in middle (cuscus behind it). I have a large toy platypus also (you can see it here in the middle of the image). The brown animal to the right of the platypus is a rhynchosaur. Yes, a toy rhynchosaur. Experienced collectors will note that some of these pieces (and those in other photos) are yowies, and if you don't know what yowies are (the toys, not the cryptids) it's time you found out. More assorted creatures. The lemurs and other primates at far right are among the best here: there's an aye-aye, a sifaka, indri and others. Finally, deep-sea fishes. These toys all glow in the dark. Hi-res version here. My favourite is the gulper eel at far right. More to come, and back to proper tetrapod zoology soon. For the latest news on Tetrapod Zoology do go here. Uh- oh, we are in trouble now! I have only a few toys-- I'll send a pic of a very strange Mandrill with bendable arms and legs. Tell me more-- a link? Click on "4 page A3 size" or "10 page letter size" for the option you want. Good pictures. I mostly have prehistorics but I like the rare and endangered animals I had a few Freiends of the Earth Quagga and I want to find the K&M Przwalski's horse. Where did you get the rhynchosaur? Please identify the manufacturer. Thanks. ¡I love your collection! Shall we interchange the repeted ones? Me likey...reminds me of the Berkeley bone shop, except with less dead things. My 3 yo son is crazy about deep sea fishes like fangtooth, gulper eel, viperfish etc. Mind if I ask where you got yours? I need a Gulper eel. Does anyone know where to find one? Where did you get yours? Great Collection dude. Thanks for sharing the images and pictures of Godzilla toys. I like Godzilla toys so much. What brand are the aye aye and indri figures?